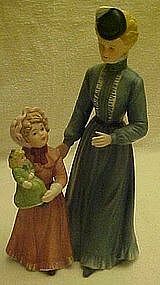 Originally Sold by: Home Interiors for $39.95 SIZE OF FIGURINE: 9 1/2" Tall x 5" Wide x 3 1/2" Deep Homco #8812 Victorian Figurine. The Mother is wearing a Long Dark Blue Dress with a matching hat. She has Blonde Hair that is fixed in a Up Hair Style. The Mother, Daughter and Baby Doll all have Green Eyes. The Daughter is wearing a Long Mauve Dress, she has Blonde Hair like her mother and she is wearing a Bonnet. The Daughter is holding her Baby Doll who is dressed in a Long Green Dress, and she too has Blonde Hair with Bows. The Exquisite Statue is so perfect that the fingers and hands of the Mother Figure is still in it's original "Perfect" condition. Wonderful condition with no chips, cracks, or repairs.